Boil your noodles, drain and run under cool water. Wiggle your fingers in them. Heat the oil in a large skillet over medium high. In batches, lightly season with salt and sear the sliced chicken until cooked through and browned on both sides, about 3 minutes per batch. Set aside and cover to keep warm. In a small saucepan, combine the water, fish sauce, lime juice, chili paste and brown sugar. Heat to dissolve the sugar. Remove from heat. Place the noodles in the center of a large platter. 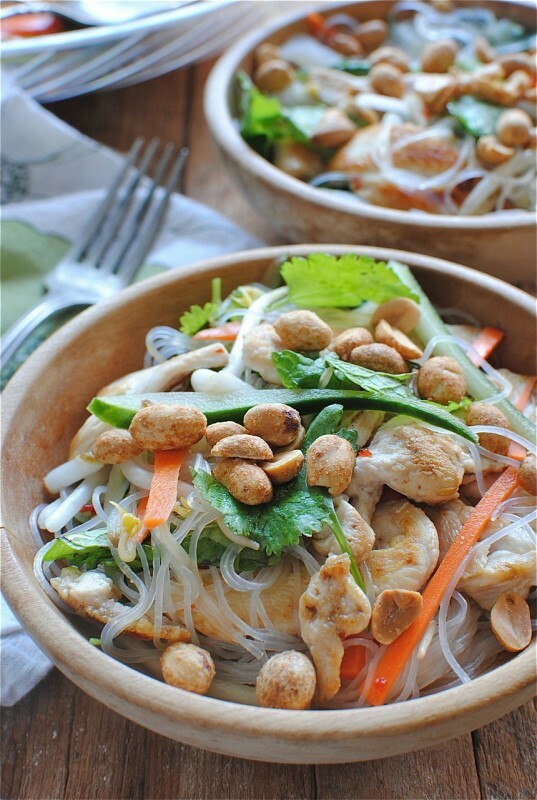 Top with chicken, carrots, cucumber, bean sprouts and mint. Pour the dressing over the dish and toss to combine. Serve the salad garnished with peanuts and cilantro leaves!